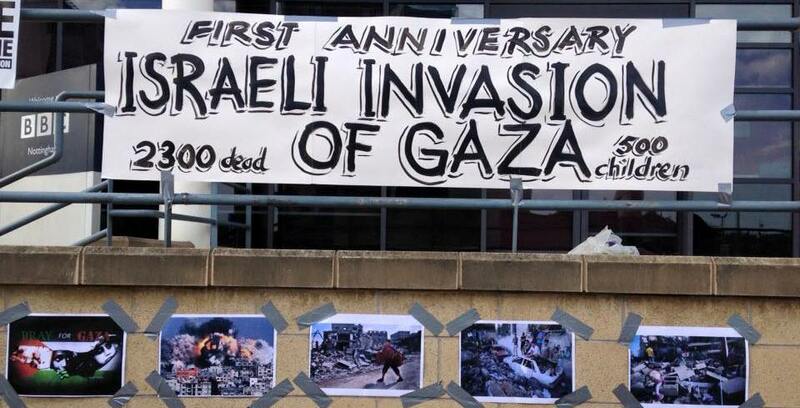 Yesterday, my branch (Nottingham) of the Palestine Solidarity Campaign held a commemorative vigil for the child victims of Israel’s murder-spree on the Gaza strip, last summer. All too often those who die in conflicts around the world are reduced to numbers. Stripped of their identities and recalled simply, if they are recalled at all by anyone outside their families, as a faceless statistic. We couldn’t let that happen. Instead, our members read out the names and ages of all the five hundred-plus children slaughtered as Israel piled war crime upon war crime when it bombed the most densely-populated land mass on earth. Please take a few minutes to read the list and reflect. Imagine that one of these children was your child. When you’ve done that, don’t stand idly by. Join us and help bring an end to the oppression and ethnic cleansing of the Palestinian people. Apply here or get in touch with your nearest branch. We took part in the march in Nottingham last year, my little girl was selected to present the BDS mandate to the Sheriff of Nottingham. I remember seeing photos of some of these poor victims and so many resembled my own children . Whenever we went to a playground last summer I couldn’t stop thinking how fortunate my children are to be safe and happy. It’s horrifying particularly seeing multiple members if the same family on the list. A year on I’m feeling more despondent about the plight of Palestinians especially now the Tories are back in power.